Paul & Joe will launch their new Smudgeproof Mascara (3000yen) and Waterproof Mascara Duo (3500yen) on 1 June in Japan. Easily removed with warm water, the Smudgeproof Mascara comes in 4 shades: Noel (black), Brown, Blue Hibiscus (LE) and Pink Sandbar (LE). 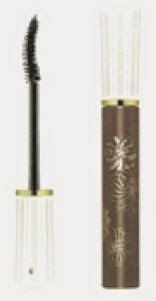 The mascara duo comes in 2 shades (black and brown) and contains hydrolyzed silk protein and olive oil for nourishing the lashes.